Unsure of how Auctions or Silver works on T4 servers? Hopefully this guide will shed some light on how things work and answer any questions you have. Thanks to Avi, Chrisvc and Tschena for the images and information (the original guide is available on the T4 beta forum). This wouldn't be possible without your help ! What are Auctions and how do they work? How do I put my own item up for auction? How do I convert Silver to Gold or vice versa? If my information is incorrect, or you feel this could be improved in any way, please let me know. Any constructive criticism is welcome! Post was edited 2 times, last by Second Heartbeat: Adding URL links. ( Feb 14th 2011 ). 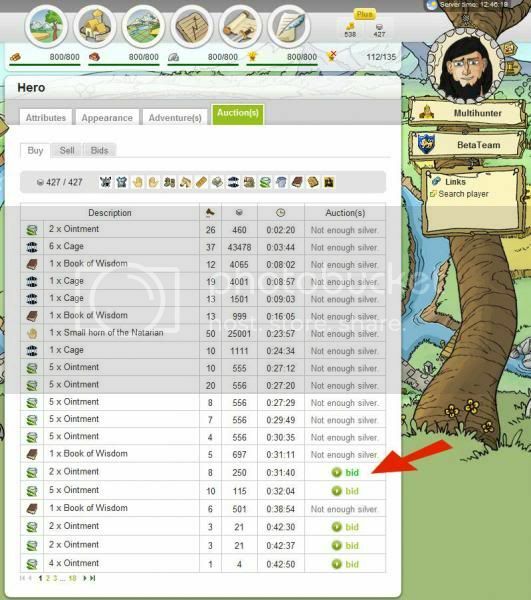 Auctions have brought a brand new layer to the game of Travian in T4.0, allowing a player to buy and sell items through other players bidding on the item, with the highest bidder winning the item. 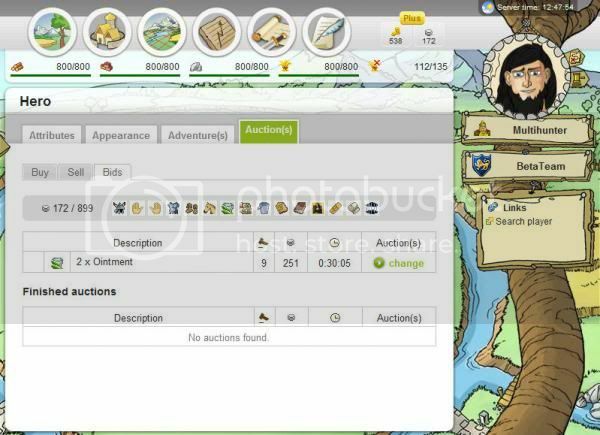 Similar to the Market Place, a player will look for something that they wish to buy and place a maximum bid on the item. 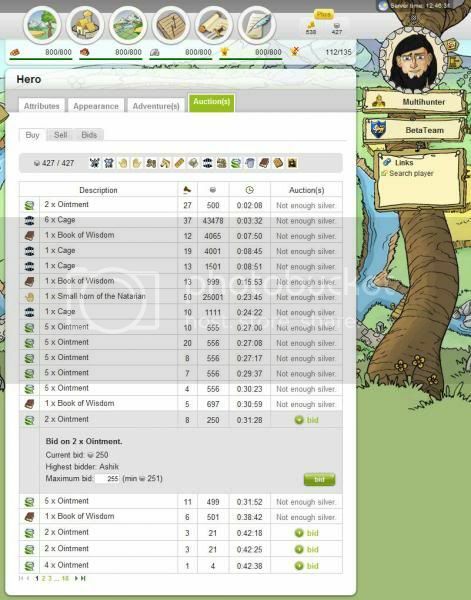 For example, if a player spots an item that they believe to be worth 5000 Silver, they would place a maximum bid of 5000, meaning that if anyone else places a bid in between 0 and 5000, they will still be the top bidder on that item. Another player would only become the highest bidder if they bid 5001 Silver. However, they do not know what the highest bid is and will only find out through trial and error. Only once the auction as finished will the players know who has won the item. Like a good punchline to a joke, timing & experience are important for auctions. It is important to remember that every bid within the last 5 minutes will reset the countdown to 5 minutes. This helps to stop others being able to slip in at the end and steal away an item from another. It is still important to keep an eye on any bids that you have so that another player cannot sneak in at the end and take the item without you knowing. Post was edited 1 time, last by Second Heartbeat: Editing to keep information correct. ( Feb 14th 2011 ). First, you must find the Auction Hall. This is done by clicking on a small tab with a hammer on it beside your Hero's picture. Clearly displayed is the item being bid on is, the current highest bid along with the person who placed it and finally the minimum bid that you must enter. From here, you can keep track of your bids, bid on new items, or sell your own items. Post was edited 1 time, last by Second Heartbeat ( Feb 14th 2011 ). Once you are on the Auction page, click the "Sell" tab. This will give you the option to sell the items you have. From here, click on the item that you wish to sell. Next you enter the quantity of the item that you wish to auction. This is helpful if you have several hundred of the more common items, such as Ointment, but only one piece of Armour. As long as another player has not bid on your item, you can cancel the offer much like you can on the Market Place. However, as soon as a player bids on the item you lose the ability to cancel the sale. 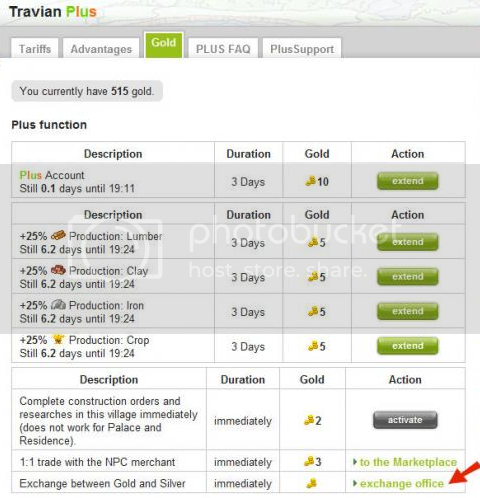 Exchanging Gold for Silver (at the rate of 1 gold for 100 silver). As a reward from the Taskmaster for completing tasks. By auctioning items in an Auction. From here you then are given the option to exchange Gold for Silver. This allows you to top up your Silver levels with any gold you have. Also remember that you can exchange Silver back to Gold at the rate of 200 Silver for 1 Gold! Like a good punchline to a joke, timing & experience are important for auctions. While a player may bid 5000 Silver for an item, leading the auction right up to the end, another player may swoop in and place a bid of 5001 silver a minute before the auction ends, giving them the item. On the other hand, no-one else may be willing to pay more than 5000 for the item and the player may be the highest bidder from the start until the end. Thanks for the guide. One point though - I thought that if you placed a bid on an item during the last few (5?) minutes the system will reset the time remaining to 5 minutes to prevent last minute swoops. Time resets to 5 minutes with each new bid within the last 5 minutes. Question. If you place a maximum bid of (say) 100 for an item, but the previous max bid was (say) 75, and there are no more bids so you win the auction, do you pay 100 or 75? If the previous max bid was 75, then you'd pay 76 not 100. Finally got me a gladiator helmet. Had to shell out 6224 for it though - but that's better then the ridiculous 80k odd they were going for at the start. On the upside my boots of regeneration seem to be selling like hot cakes! i put an item up for auction it did not sell... why didn't I get it back to try to sell at a later time..... Game problem needs fixed. All items that you sell automatically have some silver bid for them to stop people getting them for free. (For example you sell 200 cages and someone could get them for 1 silver. The set price means you must get 200 silver or over). In that example I'd rather have some silver than no silver, wouldn't you? To reiterate the way the auctions work in a little more detail - all game equippable items such as helmets, swords, boots, shields / pennants / maps, will start at a base value of 100 silver when you put them up for sale. If no other players bid on the item, then you have the right to cancel your sale within 24 hours (1x servers) or 8 hours (3x servers) and re-sell it at a later date or a different time of day. If you don't end up cancelling your sale, and the sale goes through without any bids, then the item is sold back to the game, which will buy it from you for the base value mentioned above - so you never get nothing for your goods, always a little compensation! Consumables sell for a base value of 1 silver. So if you were to sell a Book of Wisdom, an Artwork or a Bucket, the base sale would begin at 1 silver. If you were to sell group consumables, eg 48 ointments, or 48 cages, 48 bandages, then this auction lot would begin at a base value of 48 silver (1 silver per unit).